Rarely do I see video games covered on horror websites. There are a ton of survival horror games out there that deserve attention amongst horror fans. I'm sure most horror fans play games on their spare time, as do I. Since November I've been hooked on the latest Call of Duty entitled WORLD AT WAR. What was striking to me was the fact that Treyarch actually went back to World War II, which I didn't mind at all because I'm a WWII fanatic, and CoD2 was my favorite entry at the time. I played Modern Warfare way too much, so it was time for an upgrade. I picked up the game, and it's amazing. The battles are crazy, the cut-scenes are amazing, the gore is intense and it feels like a WWII version of Modern Warfare. On top of that, you got zombie mode! 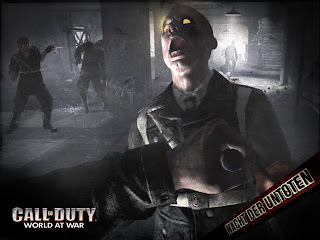 Which is why CoD: World at War was featured on a few horror sites (including ours). I'm hooked on that multiplayer. So, I went to sleep early last night, and woke up around 1 am. I figured I would play online for a bit, and for some strange reason my 360 wouldn't read the disc. Apparently the console scratched up my game. Okay, I'm fucked. I've been sucked into this game for months, and now I can't play it. I'm sure there are thousands of people out there who've had this same problem with other games. I read reports all the time about 360s scratching and even cracking game to the point where they're unplayable. As if the "three red lights" weren't an issue, now I have to be cautious when putting in new games. I guess I'll have to install it onto my hard drive. I'm just curious as to how many of you out there reading this had a similar problem?